What is the security concerns of AzureAD? We have lots of documents about Microsoft on-premise AD security problems and methodologies to find them and test them, but for AzureAD there is not much information about the possible problems and how to test them. Can I use BloodHound on AzureAD or is there a hack around it to work with it? Does Azure has a tool-as-a-service already that we can use? Can you recommend some list to check at least manually? Azure AD is SaaS so Microsoft is responsible for scanning and securing the infrastructure. It’s important to understand the division of responsibility between you and Microsoft. 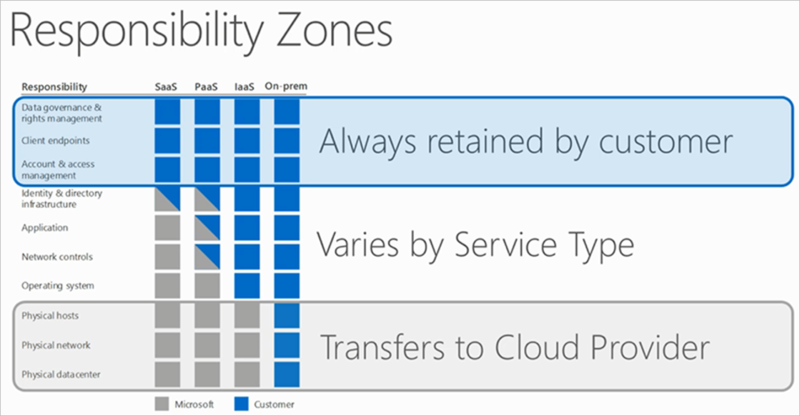 On-premises, you own the whole stack but as you move to the cloud some responsibilities transfer to Microsoft. The following responsibility matrix shows the areas of the stack in a SaaS, PaaS, and IaaS deployment that you are responsible for and Microsoft is responsible for. BloodHound is a tool for analyzing the trust relationships in Active Directory (ADDS) environments. While Azure AD and ADDS have similarities, they are not the same products. We have Azure Security Center, Advanced Threat Analytics and Azure Monitor and many more services that are all designed to help monitor and protect your cloud environment. Not the answer you're looking for? Browse other questions tagged active-directory azure or ask your own question. How do I deploy AD in a hostile location? What are the security implications between Domains, Forests vs RODC's in Active Directory? What is the real risk from trusted forests / domains? what is the role of RADiUS server and Active Directory to increase the security in wireless networks? How does the authentication flow with Azure Active Directory differ from Azure ACS? Efficient way to demonstrate the value in Active Directory security improvements? How Do I Create a Production Client Authentication Certificate for Azure Key Vault? How are stateless firewalls useful in public cloud platforms?